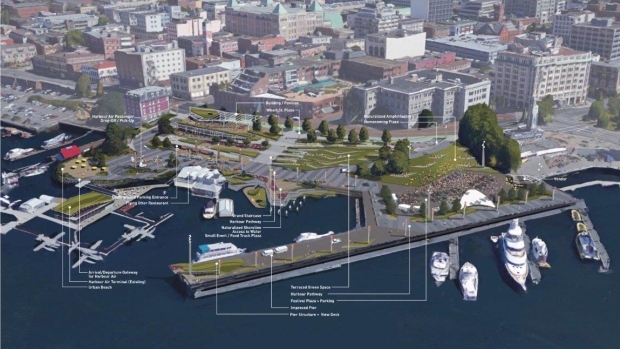 The city is mulling the idea of installing a giant staircase in Victoria’s Inner Harbour as part of a plan to better utilize Ship Point. Officials say they realize that a large concrete parking lot in the harbour is prime real estate that is not being fully utilized, and plans are in the works to reinvent the space. One of the biggest challenges is how to connect Wharf Street, which is nine metres above the parking lot, to the lower Ship Point area. That’s where the idea of a grand staircase comes in, and the steps would be installed where Courtney Street meets Wharf Street. The city is hosting two open houses at Ship Point to show off a draft design to the public, which will eventually serve as the basis for the Ship Point Master Plan. The first will take place Saturday from 11:30 a.m. to 2 p.m., while the second will take place Monday from 4:30 p.m. to 7 p.m. In September, plans will be presented to council including how much it will all cost. To read more about the proposed changes for Ship Point, visit the City of Victoria’s website.